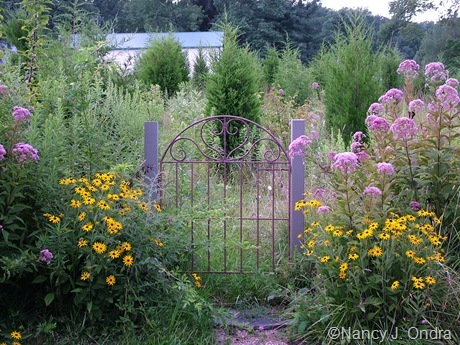 In anticipation of the upcoming Earth Day (April 22, 2010), Jan over at Thanks for Today is asking her fellow garden bloggers to post about what they’re doing to contribute to a sustainable lifestyle, as part of her Garden Bloggers Sustainable Living Project. Her request gave me the incentive I needed to work on a post I’ve been thinking about for the last several weeks: the whole “joy of the meadow” thing. When I moved here, Hayefield literally was a hayfield, separated from the rest of my parents’ farm by intersecting roads. I remember it being in corn for many years, but eventually it stopped producing well and the person who was doing the farming turned it to mixed-grass hay production and mowed it once a year, around early July. Honestly, I had mixed feelings about building a house here: I really wanted to live on the farm and have enough room to garden for the rest of my life, but I felt guilty at being one of those people who build a new house on undisturbed land instead of buying an existing home. 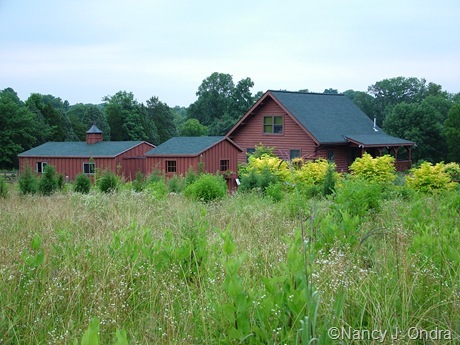 My compromise was determining that I would try to create a homestead that was even more ecologically healthy than it was before, with plenty of wildlife habitat that wouldn’t be disturbed by summer mowing, and with no use of chemical fertilizers or pesticides. 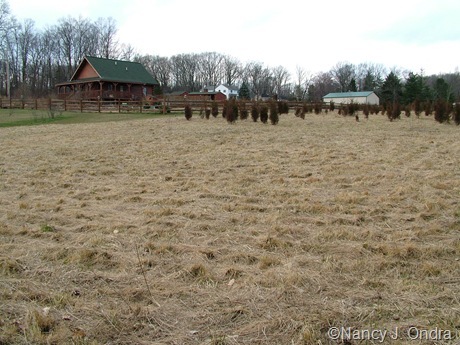 Even though this part of Pennsylvania is relatively rural, the typical 2- to 5-acre residential lots around here are almost exclusively mowed as turf, so it didn’t take long for the comments to start once I stopped mowing the upper half (around 2 acres) the year the house was done. “Aren’t you gonna cut that for hay?” “You gonna let that just go to weeds, then?” Sigh. 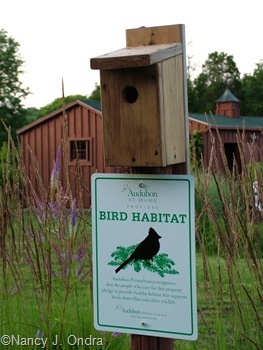 I finally registered the property with the National Wildlife Federation’s Backyard Wildlife Habitat Program (now known as the Certified Wildlife Habitat Program) to get the spiffy explanatory sign, and then registered with Audubon Pennsylvania’s Bird Habitat Recognition Program and with Monarch Watch’s Monarch Waystation Registry too. I’ve seen passersby pause to read the various signs, and the comments have pretty much stopped (or at least, I generally don’t hear them), so I guess the signs are working. 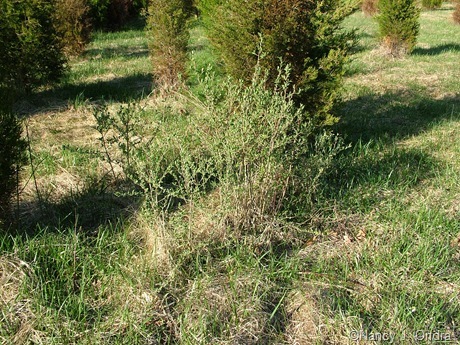 I decided to allow the native Eastern Red Cedar (Juniperus virginiana) seedlings to come up as they wished in certain areas, and the seedlings of other native trees and shrubs too, such as sassafras (Sassafras albidum) and flowering dogwood (Cornus florida). 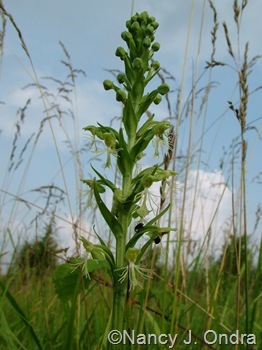 It was neat to walk through the area to hunt for native wildflowers, like ragged fringed orchid (Platanthera lacera), and to see the plants and wildlife up close. I’ve enjoyed experimenting with mowing the walking paths. For a few years, I used a labyrinth pattern and set a bench in the center. It was a fairly intricate pattern that took about 10 minutes to walk, so having a place to sit for a spell before the return trip was a nice reward. More recently, I’ve been using a grid pattern, based on the pattern used at the French garden Le Plume (I’ve blogged about it before, in A Nod to Le Plume). 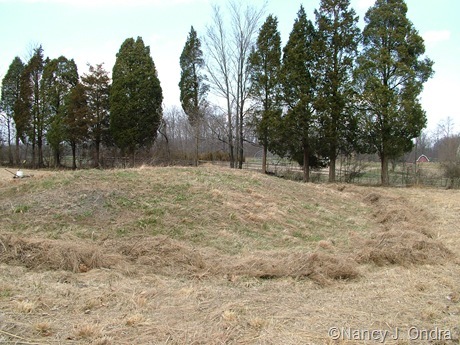 I had a somewhat different situation on my sand mound, which is essentially a raised drainage field for the septic tank. (That’s a common thing for newer construction around here, where the topsoil is too shallow or – as in my case – the seasonal water table is too high for a typical in-ground leach field.) 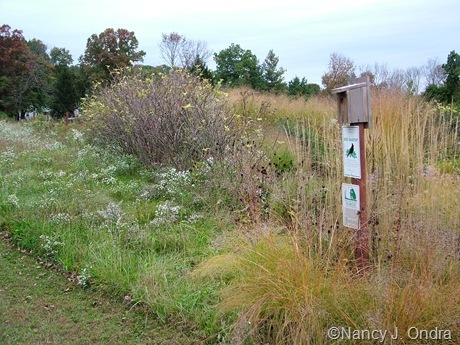 Faced with a quite large, sloping-sided, 4-foot-tall, rectangular mound, I contacted Gary Campbell of Campbell Natural Landscape Design, a local designer who specializes in ecological landscaping, and he came up with a custom mix of grasses and forbs that could tolerate the gravelly, exposed site. That area had been left with bare soil after construction, giving me the experience of starting a meadow from seed based on Gary’s list. 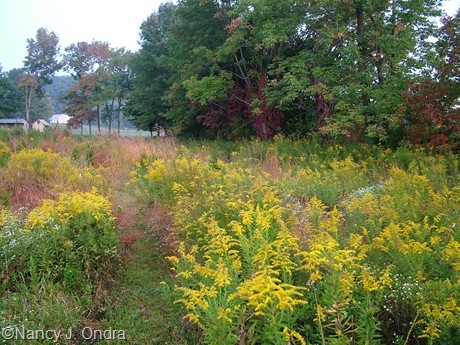 It was a lot of work, but it was rewarding to see the changes there too, as the shorter-lived plants like black-eyed Susans (Rudbeckia hirta) gradually faded out and longer-lived residents such as stiff goldenrod (Solidago rigida), wild quinine (Parthenium integrifolium), round-headed bush clover (Lespedeza capitata), white wild indigo (Baptisia alba), and little bluestem (Schizachyrium scoparium) took over. And in return for a total of about 8 hours of mowing a year, and no other maintenance, I got to have the pleasure of seeing and providing habitat for cool plants and wildlife. More recently, though, I’ve been getting a little discouraged by the whole thing. Part of it is due to the continual fight with the invasive exotics. 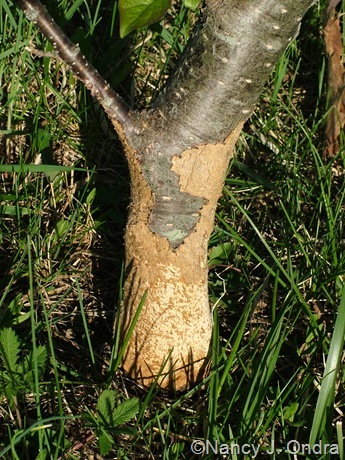 The brush mower gets most of the multiflora rose, but the stumps sprout again every year despite the plants being weakened and deformed by rose rosette disease. And, now, the rose has come up with a new tactic: it sprouts right at the base of the cedars and grows up along their trunk, then sends out its thorn-laden shoots right around face level. 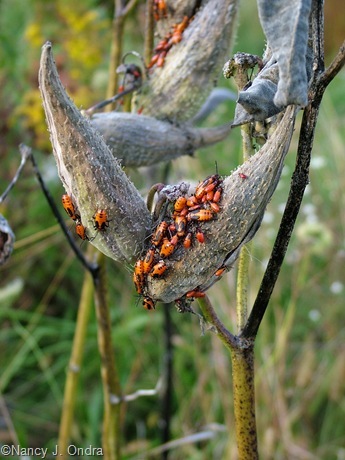 It’s not so much of a problem when I’m just walking and on the lookout – I never go out to the meadow without at least hand pruners anymore – but a nasty experience when I’m mowing and looking down to avoid trampling interesting-looking seedlings. 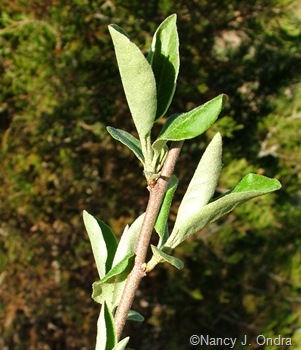 Another disappointment is finding out that quite a few of the seedling shrubs and trees I was leaving have turned out to be bad stuff, like Tartarian honeysuckle (Lonicera tatarica) and autumn olive (Elaeagnus umbellata). So now, I have those to cut down as well. Japanese honeysuckle (Lonicera japonica), which once stayed as a climber in the hedgerow along the back property line, has crept out a good 10 to 15 feet into the meadow as a ground cover, and trying to walk through there without tripping on the vines is a nightmare. On the sand mound, Canada thistle crept in. Not wanting to use herbicide, I tried to keep it in check by hand-pulling, but it got away from me. Finally, I’ve had to resort to summer-mowing parts of the mound to keep the thistle from seeding, and in the process, I’m also having to mow down the baptisias, butterfly weeds, and other beauties too. In areas where the plants used to be somewhat thin, Japanese stilt grass (Microstegium vimineum) – the reddish haze in the photo below – has seeded in over the past few years. It’s amazing how fast this annual stuff spreads. And when it dies in late fall, it forms a dense thatch. Sturdy perennials seem to be able to sprout up through it, but more delicate stuff seems to have gotten smothered out. And what’s worse, it provides perfect winter cover for meadow voles (a.k.a. meadow mice). Their populations have exploded despite frequent hunting by neighborhood hawks and cats, and this winter, thanks to the dense cover of dead grasses, the voles nested everywhere and feasted heartily on the bark of young trees and shrubs and the crowns of many perennials and grasses. Now, that’s not totally a bad thing: the feeding seems to help rejuvenate some of the grasses with dense crowns (much as dividing would do in the garden); plus, the voles destroyed some of the multiflora roses and other woody invasives. But their feeding also destroyed many of the woody natives that I was nurturing out in the meadow, which is very disappointing. 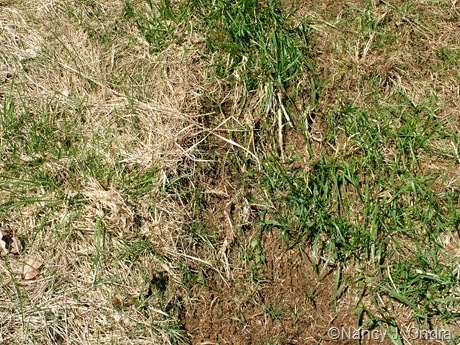 Recently, I looked into control measures for these menaces, but even with all of the destruction, I simply can’t face resorting to poisons, so my best bet seems to be removing as much of the dead grass as I can, so they won’t have as many places to hide. I spent about the same amount of time raking around my special trees in The Shrubbery, where I had decided to stop mowing regularly a few years ago in the spirit of further sustainability. I guess I’ll have to do that again this fall, and who knows how often again in the future, in hopes of minimizing further vole damage. Hand-raking isn’t a reasonable strategy for the other few acres, and burning to remove the dead grass isn’t an option either, so I still don’t know how I’m going to deal with the voles there without resorting to poison. 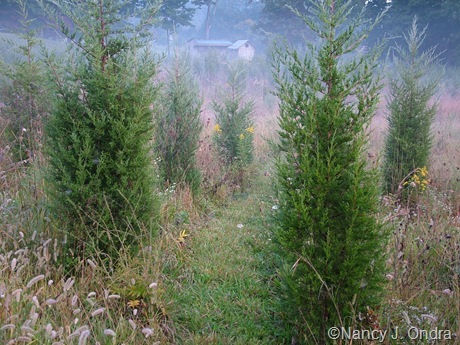 I think the final blow was seeing a popular new meadow book dismiss projects like mine as merely “non-native pastures,” which apparently “can be managed to make beautiful meadows” if all of the woody plants are removed, accompanied by a photo of my own cedar-dotted meadow (not the image below, but one taken in the same general area) used basically as an example of what not to do. Apparently, those of us who want proper meadows would be best off using multiple applications of herbicide to start with a blank slate, then hiring a landscape contractor to plant the thousands of plugs we’ve acquired through a supplier who did the contract growing for us. 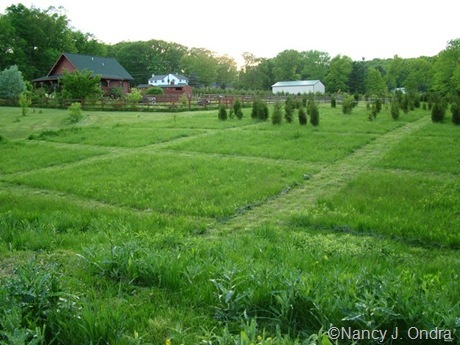 Well, sorry – as much as I like to support the nursery industry, I’m not independently wealthy, so it would probably be cheaper for me to simply mow my whole meadow (excuse me, “pasture”) every week or two and treat it like a lawn. And oh, apparently we’re supposed to fertilize our meadow at least once, too, and water it once a week. Geez, I don’t even do that for my garden. Hmmm. 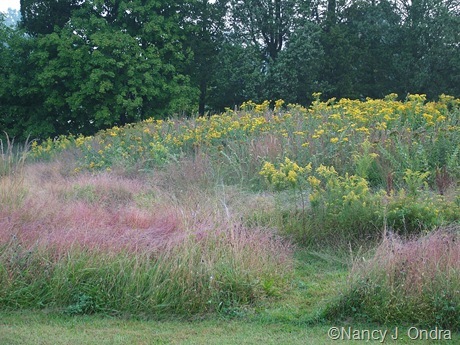 So, maybe what I call meadow isn’t up to the standards of a true meadow expert, or aesthetically pleasing enough to be photographed as an example of how beautiful a northeast pasture/meadow can be. But you know, I can’t help but think that my own little patch of the planet – weeds, voles, and all – is more diverse and habitat-rich than it was before I got here, and that’s enough to make me proud of the changes and choice I’ve made to get it this way. If you’d like to share your own strategies for sustainable living, or if you’d like to read about other bloggers’ adventures, check out the links here at Thanks for Today. Thank *you* for providing a reason to stay inside and work on this much-delayed post, Jan. I’m glad to support your great idea. I think you meadow is marvelous. It is so much better than a mown lawn. You need a pack of coyotes to keep those pesky voles at bay. Maybe some day they will move into your area. You won’t have feral cats either. That prospect sounded promising, Lisa, so I did a bit of poking around on Google and discovered that coyotes *have* been seen in every county of Pennsylvania. The scary part is there’s evidence that they’re mostly coyote/wolf hybrids capable of killing deer (and, I assume, alpacas). I think I’d rather worry about voles than have to lock Duncan and Daniel in the barn every night! I enjoyed reading the story of your thought process, actions and results for meadow gardens. 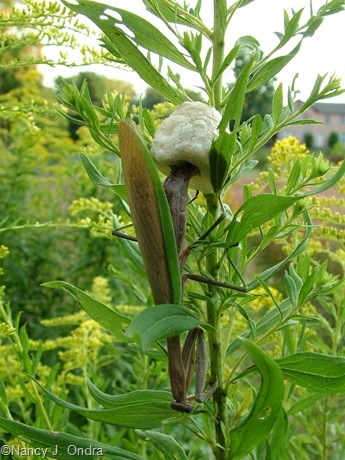 Clearly, your gardens provide a wonderful habitat to creatures large and small. Your story of the meadow garden is of high interest to us as we’ve pondered this at least 100 times with our 2+ acres out front. My husband was a forester (once upon a time). Controlled burns is how they managed to rid an area of the underbrush each year. 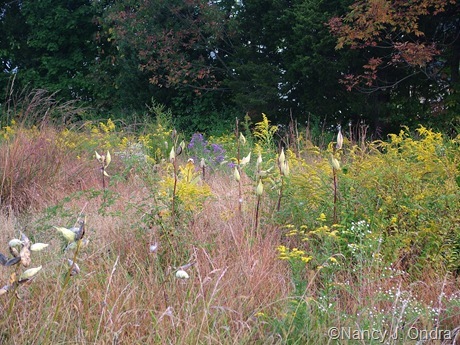 Magically, the native wildflowers and trees sprang up from seeds after the burn. I’ve noticed that the NC Botanical Garden here in Chapel Hill has an area where they practice the same methods. I thought about burning, Cameron, but the meadow wraps around the boys’ pasture, and I’d have nowhere to take them to spare them the stress of a fire. They get upset even when the neighbors burn brush. I sure wish there was more information out there about managing these sorts of meadows. 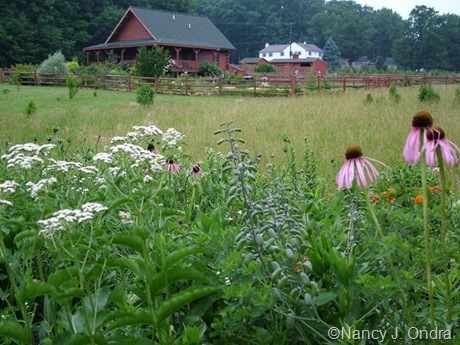 I’ve found tidbits here and there but (so far, anyway) no books that address managing meadows for habitat. I loved reading about your meadow. Those voles and exotics are the worse but your meadow is lovely. Thank you, Tina. To be fair, the challenges I have here could be much worse. 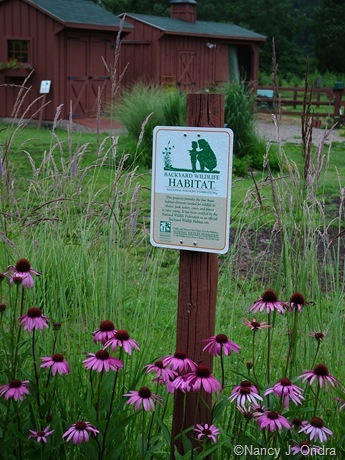 I’ll never get rid of them, but if I can try to keep favoring the native plants and healthy habitat, I’ll consider my stewardship to be a success. This is a very interesting post. I can tell that having a “meadow” is a lot of work, and as it changes, our techniques have to change, or we at least have to figure out a new strategy for each change. 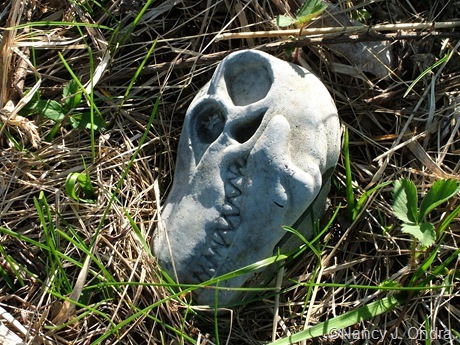 It is probable that something or someone could move in to take care of the voles, but as you noted, if it is a coyote/wolf creature, it might not be a good thing. I have had voles even on my suburban lot. That’s a really good point, Carol, about having to change maintenance techniques as the meadow matures, just as we have to do in the garden. The meadow definitely is proving more of a challenge than I expected, but on the other hand, I’m never tempted to move the plants around out there, which automatically makes it much less work than my garden. It does look lovely, and provides habitat, and if Sir in The Book don’t like it – that’s his problem! Thanks for the vote of support, Diana! To be fair, that author’s approach to meadows is a fine alternative to traditional lawn and looks great in his region. But I happen to think that for those of us on the East Coast of the U.S., there’s a place for the classic “old field” look as a compromise between relentless mowing and garden-like meadows. It sure would help if someone would write a book for us on Meadow Management 101. So do I, Jim. And so do the insects! I simply love your property! Especially the meadow. Kudos to you on your hard work at creating this wonderful haven for you and your family. Thanks, Nancy. I enjoyed reading the post you wrote for Jan’s project too. Wow. I had NO idea that a meadow was so much work. Congratulations on the natural habitat. It looks wonderful! It takes a lot of work to have that natural, carefree look, don’t you know. I’m sure there’s much less input in mowing time than turf would require, but it takes more specialized care than I expected to control the undesirables and favor the “good” plants. I think your meadow is beautiful. We have old pastures surrounding our old farm house and we haven’t yet managed to put in the efforts you have, but we do some mowing and have plans to do more. In the meantime, one field has grown up in white pine and the forester who gave us our management plan said the trees are good quality and to leave them until they can be limbed up some, and ultimately logged. I’ve linked my post to Thanks for 2day as well. That’s great about your pines, Pat. I found a few baby pines in my own patch this spring. At my parents’ place, we’re trying to get some of the fields on the woods’ edge revert back to trees, and it’s fascinating to see how woodies are seeding in from the hedgerows around them: not cedars so much, but nice hardwoods like oaks and hickories. There, we’re mowing only every 2 or 3 years, mainly to knock down the multiflora rose. And I do them with my brush mower rather than a tractor, so I can mow around the desirable seedlings. Thanks. Nicole. It would be even better if I could manage it in a way to reduce the power-mowing needs even further to cut down or eliminate the need for gasoline. That will be my next step! It seems like each of us who own an older pasture has unique invasives to deal with. In Ohio, I have had to contend with vigourous honeysuckle vine that takes over if mowing stops (as well as the ever present multiflora rose). I think we might have to look to some of our early ancestors for examples of how to handle this; perhaps a rotational use of the property—fallow field for a period, goats or sheep for the next year(s) to tackle and eat/reduce invasives. Even hogs will tackle a lot and reduce it to fresh and fertilized soil in short order! I read of rental companies that can bring goats to a location to work it over, reducing kudzu and other undesirables. Would goats get along with Duncan and Daniel? I think the key is to coming up with a workable plan that will allow a rotating use that allows a meadow to develop during some years. Perhaps as gardeners we need to realize that we can only offer an evershifting panorama of flora. Wow, Dan – I’m so glad you brought up that idea. I’m doing that without even thinking about it when I wrote the post. There’s one part of the meadow where the smooth brome (an aggressive, non-native grass) is so thick that little else is growing. The boys like to graze on it, though, so I dismantled the fencing around one of their other pastures and fenced in that area of the meadow for them to eat. The former pasture had been in a similar state a few years ago, and they did a super job in weakening the brome, and the multiflora rose as well (which they *love* to nibble on). It’ll be very interesting to see how that area evolves over the next few years. You know, it now occurs to me that I was out of line getting snippy about that writer calling our meadows “pastures,” since I am in fact using grazing as a management tool. What we call our plots isn’t as important as how we care for them, right? Yes. 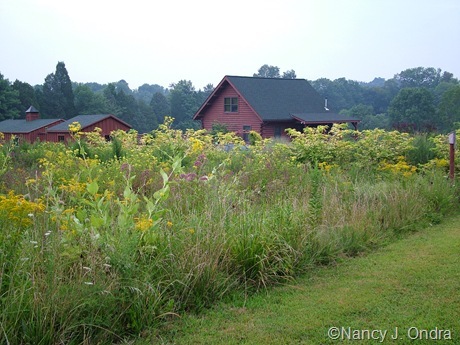 I remember my grandfather’s dairy farm being ‘gardened’ by cows, but still having wonderful swaths of Eupatorium, Joe Pye Weed, Asclepias, during grazing years, and full measure of cone flower, daisies, and others during the off years. A meadow? A pasture? For sustainability, I do think it matters more about our care for our surroundings, call it what we will. A definite meadow even if it does have some plants of a new sort. Great post Nan and I think I can sense a whole new book about ‘Meadows’ in your future. Plant hunting out there *is* fun, but I think the dinosaur “fossil” was one of my best surprises. 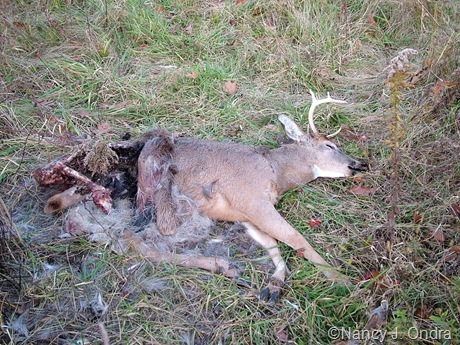 At least it wasn’t as smelly as the deer. A thoughtful and very interesting post. It’s a myth that nature will just take care of things, and I much appreciate your struggles. Thanks for sharing — great photos! You had some great points in your post too, TM. I was thinking about it as I was potting up seedlings today. I’ll be over to leave a comment soon. Well, I believe that your pasture, or meadow, or whatever you choose to call it, is gorgeous! 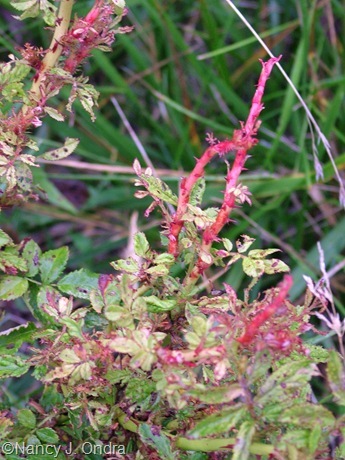 (Yes, even that non-native reddish grass… although I’m sure that its invasive status lessens its beauty some for you.) It was fascinating to see all of the thought AND work that goes into this area, Nan. Thank you. Hmm… now, who do we know who is an author around here? You’re right, Kim – I shouldn’t say this, but the stilt grass really is pretty when it’s reddish in fall. Such a thug, though! And yeah, I set myself up for the book idea, didn’t I. I wish I *could* write it: I have it outlined in my head, and I already know who I’d start interviewing to gather the information. Sadly, I very much doubt any publisher would consider the idea commercially viable. Where are all the wealthy patrons when you need one? But I *could* start collecting links to online resources as I find them, including blog posts. I know Layanee’s written about burning her grasses, for instance. Thanks for coming back and commenting, Jan. Your summary of the meadow experience is right on target, and it drives home the point to me that my garden have a whole lot in common! I have exactly the same experiences (voles, multiflora roses, invasives, etc.) 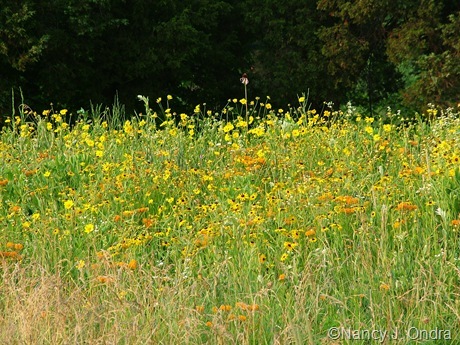 in the “meadow” that surrounds our half acre cultivated lot, but we don’t own any of it. It is common association property, not ours to do anything with. I have argued that it needs to be managed in some way, but there is no consensus on what to do (just as you are struggling with how to manage your meadow), and no funds to do anything, and so we are simply surrounded with encroaching weeds. This post helped me see it’s a problem even when you own the space. A very helpful and thought-generating post for me! Good point, Laurrie, and yet another reason that we need more information on managing these lands. Where I live, the local and county governments have made great efforts to preserve open space, but maintaining it effectively is another matter. That gives me another idea: some clever person might be able to make a great business out of meadow management: mowing, controlling invasives, burning, rotational grazing, and so on. If private landowners and communities could access a resource like this as readily as they can lawn care services, maybe they’d be more open to replacing some turf with meadows. My goodness, Nan, this was quite a saga. The inspiration of Le Plume, and your own post about it and Gardens Illustrated set me on a whole new path. The magazine subscription, pricey but others were dropped so it is an even swap, and the mowing of paths only in our tiny lawn while letting the fan shapes grow uncut except in late winter were a direct result. Hearing about your problems with critters and exotic invasives, not to mention the scorn of meadow experts is disheartening. I do hope you are not discouraged by the problems. It is still a worthwhile endeavor and you are a good steward to that beautiful land. Thank you, Frances. I was rather disheartened at the time I wrote the post, but now that the work out there is done for a while, and now that I’m enjoying the blooming wild strawberries and blue-eyed grasses and seeing that many woodies did survive the voles, I feel a whole lot more in love with it all. This post has been rolling around in my mind since I read it. I’m not sure I’ll articulate this very well, but when I was working on my biology major back in college, we had a wetlands class one semester that really got me thinking about invasive plants in a different way. The typical response seems to be to go out and try to eradicate every trace of the plants. The example that struck home for me was milfoil in our local lakes. The homeowners on the lake hate the stuff, they want it removed immediately, and so in most cases large amounts of money are spent dumping chemicals into the lake to control it, using machines to dredge it out, etc. 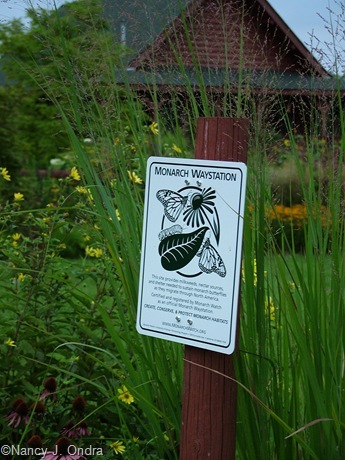 – with the related effects on wildlife and native plants in the lake. Our instructor pulled up some research papers to show us that in general, lakes where the milfoil was NOT strongly controlled recovered and stopped being choked up by it much faster. The milfoil was never gone 100%, but it just wasn’t a problem anymore; the lake’s ecosystem adjusted to encompass it: since the native wildlife and plants weren’t being decimated by control measures, they were able to adapt and live alongside the milfoil. The problem was, the adaptation process took 15-25 years, and the homeowners living along the lake didn’t want to look at a milfoil-choked lake during that time… so whenever they (or the city) could afford it, they spent large sums of money trying to eradicate it every summer – which could continue for the next 30 or 50 or however-many years, since the lake’s ecology was never given a chance to adapt. I haven’t seen any research papers on meadow environments and invasive plants (because I’m not in college or the field anymore), but it seems to me that the same mindset would work. You need to control the invasives enough so they don’t make your natives extinct during the decades-long adaptation, and I certainly couldn’t purposely walk by a flowering garlic mustard plant (for example) and ignore it – but not completely extinguishing the weeds with ruthless control measures may actually be the BEST solution in the long run. You’re giving the natives that chance to live side-by-side with the invasives and develop strategies to not be overrun. Yes, yes, yes, Meghan! I am so glad that you shared these thoughts. Now I remember hearing similar stories when I attended some wetlands restoration classes, and I also recall seeing before and after images of woodlands where people tried to eradicate *all* of the invasives. It does take a good deal of time, effort, and knowledge to selectively remove the bad stuff while leaving the natives, but wiping out everything with herbicides to get a temporarily blank slate for replanting isn’t necessarily the “easier” option in the long run. You’ve given me a lot to think about and follow up on – thanks for that! That was a fascinating read Nan. You confirmed what I have suspected about growing a meadow (or whatever you’d like to call it). I suspected that it could turn out to be a lot of work (dealing with invasives, critters, etc). But still… it’s very appealing. Your meadows look beautiful to me. Stick with your pastures/meadows. I’m sure you’ll figure out the right balance of things to do. Tending to Mother Earth can be work sometimes, can’t it?! I’m happy that you found it of interest, Jean. Yep, it’s like a really big garden out there, but at least it doesn’t require watering, which is about my least favorite thing to do! Well, this makes me rethink my future plans of having more land and making it a meadow. Or, wakes me up. I had planned on someday starting fresh, burning, tilling up, whatever to have a clean slate, but to hire people to dig plugs or set seed? Well, regardless, something like this is clearly still gardening, and it requires much bigger shovels (tractor?). If you’re planning on moving to Pennsylvania to follow your dream, then yes, rethinking to some extent may be in order. But remember, the land here wants to be wooded when it grows up; in Nebraska, your climax community is naturally grassland. So my experiences here are probably about as relevant to you as West Coast “meadows” are to me.